I guess it was either that …or set fire to …himself! Or voluntarily stepping down as leader and securing the election results and his tenure as a very very long serving National MP..with multiple board appointments and a knighthood once he leaves politics. Some people find it hard to crystal gaze. They allow their egos to blind them from the best path to future multiple wins. How do you know that those things (boards, knighthood) will happen ? Being a party leader is not a guarantee that those will follow. Whoever thought of that should be done for sabotage – they should of just used a generic person instead if they wanted to use a cartoon. His days are numbered. I also note that political cartoonists are usually important in holding the govt of the day to account…unless you’re Rod Emmerson who generally has chosen to avoid the multitude of Coalition Govt disasters (or plays them down) & instead concentrates on anything but. Those ‘Agency Guys’ huh? Too many ‘Brainstorming’ sessions! Who ever would have guessed they think the general population have the mental age of small children? I’ve been laughing at this cartoon character of Bridges ever since I first saw it. I mean, what a [expletive deleted] daft idea. Bridges’ biggest problem is he fails to resonate with the public, even though Natonal party support remains solid. This just looks like they have had to try & find a way where he might seem less boring. What – now they’re asking us to elect a cartoon character our next PM? What was the background music …. a cheap ‘soundalike’ ? No I dunno but it sounded pretty bland & unremarkable. It’s probably very legal after the pretty legal one got them in the poo. I see the House resumes on 12 Feb.
It’ll be the old nine days wonder and then it will be forgotten. It can’t be any worse than that $900,000+ ad telling us to be tidy Kiwis. Those who litter won’t stop because the PM says that she doesn’t; talk about preaching to the converted. Mikey Havoc ‘singing’ is excruciating; the whole thing’s an embarrassment. I don’t think it will be an idea to be used over a period with all the new things and old new things they want to say. Trouble is it’s out here to be used forever. It can’t be unseen. I understand seeking a novelty factor and an approach to back up and become part of their whole strategy. 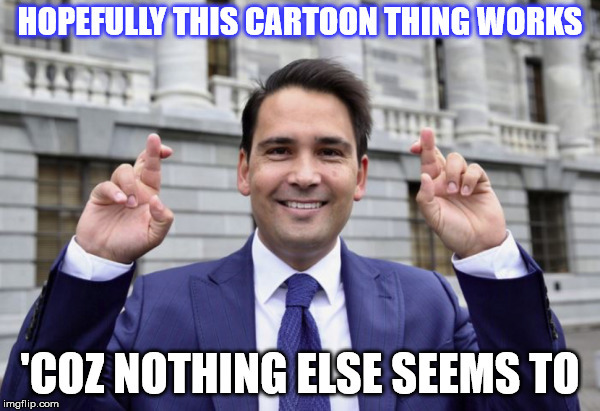 Surely though they considered that the question would be asked: What is it about Simon Bridges that rather than having him present stuff we want people to believe, we have a boyish cardboard cutout cartoon character rather than Bridges himself talk to the people? They might be hoping he’ll appeal to children and that they’ll nag them to vote for him? them = the parents, I mean. Suicide by cartoon? Hard to understand loading that gun and handing it to your political enemies. He’s far from the sharpest tool in the shed Alan. Haven’t met him in person, but two close friends of mine have, and both share the same opinion of him. he’s a boy trying to do a ..womans..job….hat tip M.C. He’s certainly done little to dispell that impression. Was he elected leader to be the fall guy? I really couldn’t fathom his selection. He’s always been a droner. he had a good start ..forcing Labour to compromise when they first gained power.Can’t remember the exact details.Bennett got in behind him. Do you mean the Speaker selection fiasco? Or wasn’t there some funny business about them getting to chair most select committees or something. I can’t recall other early wins. Coming out with hey I’m Maori, Paula’s Maori, at his “I’m the new leader” speech was a bit of a jaw-dropper right at the outset. There’s something about Simon that makes him one of those people who seem to have a gift for snatching defeat from the jaws of victory. His team (and he) have scored plenty of hits on the coalition. But it hasn’t translated into being well regarded by the general public. His awful diction is murder on the ears. I wouldn’t have thought it would be possible to be worse than Jacinda but he managed it.